The Daily Rant: Separated At Birth? 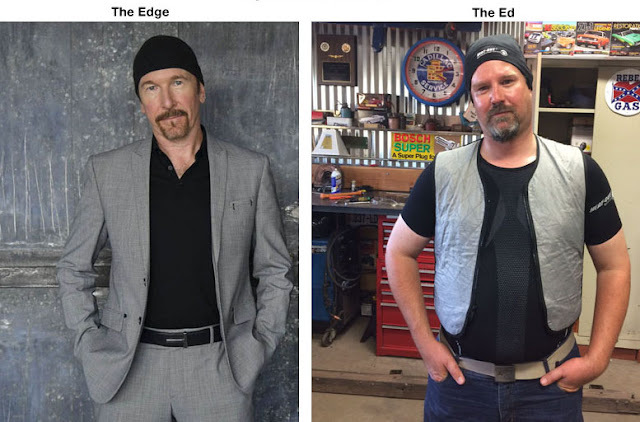 Our friend, MacG, took this picture of Ed in his riding gear foundations (his Heat-Out crew neck tee and helmet liner, and Bilt cooling vest) and did the side-by-side comparison with The Edge. For those of you who don't know who The Edge is, he's the "English-born Irish musician and songwriter best known as the lead guitarist, keyboardist and backing vocalist of the rock band U2". Don't you feel cooler now? I'll likely never meet The Edge but I really don't have to, do I? Because I have The Ed.